How do professional movie studios animate? What tricks do professional animators use in their work? What can I learn from people who animate for a living? MMD is an awesome program. It’s totally free, has an enthusiastic community, and modern effects and rendering options can create strikingly beautiful scenes. It’s not really considered a professional program. Compared to Pixar’s Renderman and Dreamworks’s Apollo, MMD is positively primitive. There are no ultra-high resource requirements, and it needs effects to work with raycast light sources. 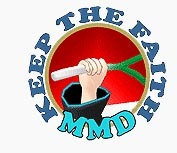 That doesn’t mean MMD is useless compared to those programs. MMD users can learn from tricks and techniques that professionals use. You may not have a gigantic render farm cranking out your animations or a staff of hundreds working on a 90-minute movie, but you can use some of their tricks to improve your animations. When I started learning MMD, I learned to animate by starting at frame zero, animating the keyframes all the way to the end, then add the camera movement, then add effects. Many of you learned to animate the same way. However, professional animators use a different method. When they start working, the professional animators create a layout pass. This is a rough guide showing where characters stand and vaguely what pose they are in. It looks ridiculous. That’s fine. It’s not meant to be seen by the public. Just do your animation as usual afterwards. It will save you a ton of hassle. You can get away with so much more than you think you can. You can have stages that are unfinished on one side or models that aren’t completely posed. All you need to need to do is hide it from the audience. This can be done in many ways. Close-ups hide an incomplete walking animation. A hidden wall can push physics items into place. Killer Beer used a physics quirk to make a flickering light, which you can read about in this “making of” article. References are a handy tool for animators. They are guides that you can use for posing, timing, and expression. Professionals use them all the time, and they have been using reference footage since the beginning of the animation. Max Fleicher created the rotoscope in 1919, which is used to copy reference footage directly onto animation cells. In the MMD world, we call that “motion tracing”. You don’t need to fully rotoscope to use a reference. A very simple way of referencing a human figure is to look at yourself in a mirror. You can reference the way your arms move to figure out how a character’s arms should move, or look at your own stance when figuring out how a character might stand. You don’t even have to look like the characters. Pop quiz: Why did early 3D movies feature inanimate objects and non-human characters? Rendering humans is hard from a technology perspective. Skin would end up looking more like plastic than anything else. Hair was mostly stuck in one place, and cloth simulation could be unreliable. If you wanted to make something starring people, it was better off live action. Pixar’s first three shorts starred a bumblebee, a lamp, and a unicycle. DreamWorks’s first 3D venture was about ants. Reboot, the first completely 3D animated TV show, opted to have the show set entirely in a computer. I actually used this tip when creating the header at for this article. The Mike model is cute, but the rig had many quirks that made it difficult to use. When I remembered the gag from the movie about Mike never being clearly visible in photos, I used that as an excuse to position him so that his rig was mostly out of the shot. Like the pros, you should Keep the Faith and credit everything you use. 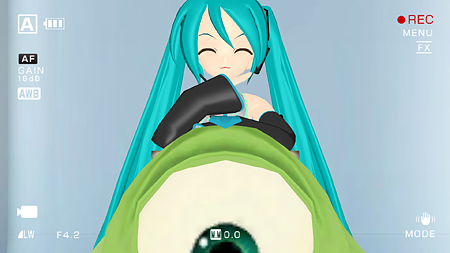 I used Animasia’s Miku V2 and FreezyChanMMD’s Mike Wazowski. The stage is Photoshoot Stage by Shiremide1. I used the Excellent Shadow and Camera Screen effects. And knot your brain to make it neat… a little.